Rag'n'Bone Man has been named as the UK ambassador for Record Store Day 2018. Now in its 11th year, the event celebrates local, independent record stores. As part of his role Rag'n'Bone Man has recorded two new songs direct to vinyl. Don't Set The World On Fire and George Has Got A Friend will be among the special releases on 21 April. Speaking to Newsbeat before the session he said: "This is one of the most amazing things I've done so far." "These songs don't exist anywhere else. They've never been recorded before. They're not on the last album and they won't be on the next one either." Record Store Day has ambassadors all over the world. In the past they've included Elton John, Metallica and Iggy Pop. More contemporary acts have been getting involved in the last few years: Slaves, Kate Tempest and Izzy Bizu were among the 2017 UK ambassadors. Rag'n'Bone Man, who is the only UK ambassador this year, says there's been a shift in attitude towards vinyl, from both musicians and fans. "It's changed a lot in the last 10 years. Now it's basically streaming and vinyl." While the number of downloads and CD sales has steadily dropped in the last five years, streaming and vinyl have continued to grow in popularity - with 4.1 million records sold in 2017. "I don't tend to look at my sales but I was given a breakdown of where it's [his music] being sold," he added. "It's amazing how much is vinyl. I'd never release music that wasn't on vinyl. "It's a true representation of who you are as an artist. You put a lot into it. "There's a certain amount of that [that] is lost with digital music." 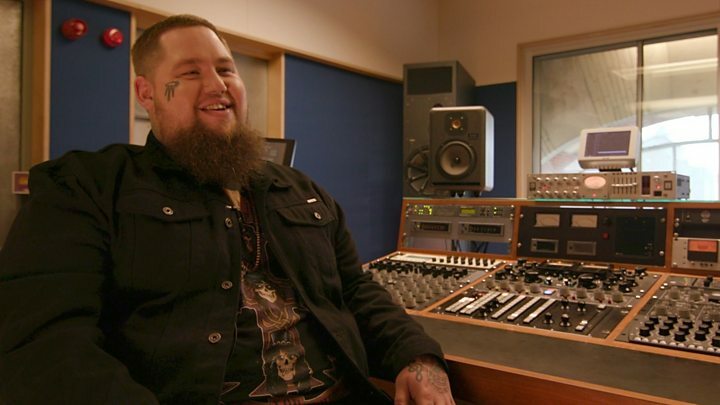 Rag'n'Bone Man recorded the new songs, which will only be available on Record Store Day, live at Metropolis Studio in London. "They're both personal songs. I wrote one of them on tour, and the other one while my partner was pregnant. She was actually in labour at the time. "That one's called George Has Got A Friend. It's about my son [Reuben] coming into the world. "Our friends have a little boy called George, that's the premise of the song. "They're both here for the recording... they're in a soundproof room." Rag'n'Bone Man been supported by BBC Music Introducing throughout his career, including performing as part of a showcase at last year's SXSW festival in Austin, Texas. "I thought I might be able to get some gigs out of it [uploading to BBC Introducing] at the time, but I guess I did a little bit more," he said. "Being able to cut a record straight to vinyl - are you kidding? It's killer!"